Garden sprayers are another piece of garden equipment that all gardeners (whether amateur or professional) need. There are many good quality brands selling them at reasonable prices that won’t break the bank then it may be worth paying that little extra to guarantee that you have a good quality garden sprayer that will last for many years. Below is the winner of our 'Top Pick Award', the Hozelock 10 Litre Plus Pressure Sprayer which is the best garden sprayer for both amateur and professional gardeners alike due to its high quality construction and size. Be sure to read our full guide to learn more about the features available and how to decide which garden sprayer would be suitable for your own needs. This is a quality product that does have many useful features as well as being very well made. Ideal for amateur gardeners who want a quality sprayer as well as professional gardeners. 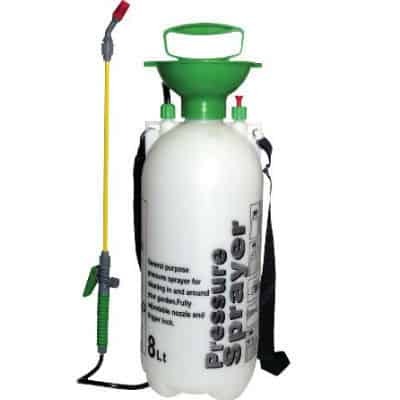 Multi-purpose sprayer with built in pressure release valve. On/off flow control, for continuous spraying with adjustable spray nozzle with last drop technology. Includes 3 year guarantee for extra peace of mind. With lots of choice available in garden centres and online shops it is hard to know which are good quality sprayers and which simply don’t make the cut. So what do you need to consider when buying a garden sprayer? That it is made from quality materials including good rubber seals that won’t perish as this will result in low pressure and poor performance. Has it been made from strong plastic that can handle lots of use and won’t crack when accidentally dropped? Is it fitted with a brass fitting which are built to last? does it have different spray setting? And finally is it easy to clean? Garden sprayers are commonly used for spraying pesticides, fungicides and weedkillers that can be purchased as concentrates which you dilute with water as it is far more cost effective than using ready-to-use products. 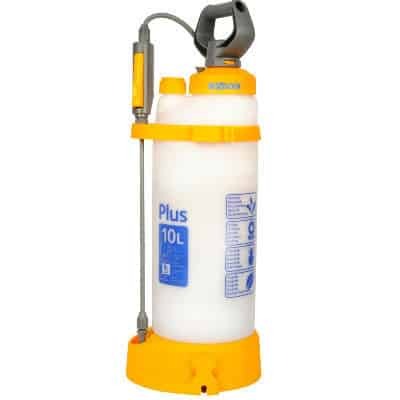 There are many sizes of garden sprayers from small 2 litre hand sprayers which are ideal for spraying a small plant or weeds to medium size sprayers usually around 8 litres for spraying larger areas to even bigger back pack sprayers that hold 20 litres for spraying even larger areas, these are usually used for spraying large lawns or spraying weedkiller on industrial sites. Below is a selection of the best garden sprayers in all sizes. 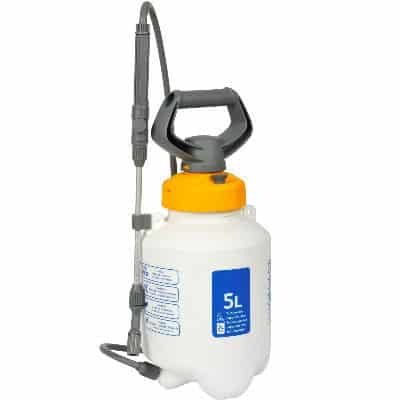 So whether you are looking for a small sprayer for spraying your prized roses or a larger sprayer for killing the weeds off your drive or patio there should be one that will do the job. 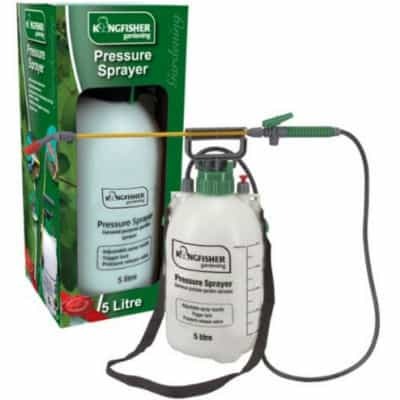 For each size sprayer which include 5 litre, 8-10 litre and 12-16 litre knapsack sprayers we have recommended the best model for amateur use and the best model for professional gardeners. Naturally the garden sprayers ideal for professional use cost more but still offer value for money whilst the cheaper models suitable for amateurs are cheaper but still good quality garden sprayers. This is a quality product and although more expensive than most other sprayers it does have many advantages and is very well made and robust and even comes with a 3 year guarantee. Ideal for amateurs who want a quality product and professional gardeners. 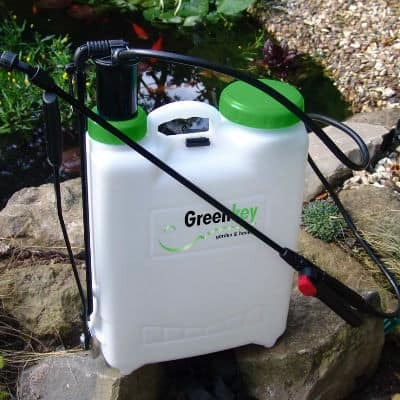 For the price, we really advise it as being for the amateur garden for use around the garden and is designed for spraying any garden chemicals from weedkiller to pesticides. Cannot really comment on any bad things about this, one tip be sure to tighten up all nuts before use to ensure no leakages. This is great for amateur gardeners who plan to spay only a few times a year, all though it is robust and good quality professional gardeners would be better spending the extra and getting a better model but if you are an average gardener this will do the job. Hozelock are known for their quality garden products and this garden sprayer is one of the best when it comes to garden sprayers. So what makes it so good? Firstly it is a multi-purpose sprayer and can be used for insecticides, pesticides, fungicides, water soluble feeds as well as weedkiller. It features a built in pressure release valve to avoid you damaging the sprayer by putting it under too much pressure and it features an ergonomic handle for pressurisation. The nozzle spray is adjustable and can be changed from a jet spray to a fine mist which makes it ideal for many spraying situations the professional gardener may come across. Finally it has a translucent bottle with measuring marks on for accurate and easy filling to ensure the mix is correct when filled. Finally it features of what Hozelock call ‘Innovative last drop technology’ to ensure every last drop is used. Ideal for those looking for a quality garden sprayer, the quality is above what most would expect and this really is built to last and is what a professional gardener what expect from a quality product. It comes with a 1 year guarantee. 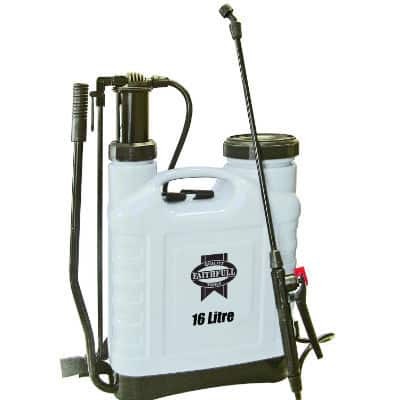 Am-Tech 8 litre sprayer is ideal for spraying larger areas a few times a year and offers value for money and is built with the amateur gardener in mind. For the price it offers value for money whilst still keeping quality in mind and is designed to withstand typical use. It features what you would expect including a shoulder strap for ease of use, adjustable trigger sprayer and measurement marking on the translucent container for easy measuring. If you are looking for a garden sprayer to spray weedkiller around your patio a few times a year or to spray plants in your garden then this would be ideal and it even comes with a 12 month guarantee. If you do regular spraying or are a professional gardener then we would not recommend this model as it is not designed with excessive use in mind. This professional pressure sprayer comes with 4 different nozzles that can be changed depending on what you need to spray. The four nozzles include a fan jet for accurate spraying, cone spray which can be adjusted from a jet to a fine mist, a twin head nozzle which produces two cone shaped sprays and a four jet nozzle which is ideal for high volume spraying. It comes with a long reach lance allowing you to spray them hard to reach places and the trigger has a built in lock trigger to reduce strain on your fingers during long periods of spraying. Designed for professionals to be used in many situations from spraying weeds on industrial car parks to pesticides and fungicides on large beds and borders. Also suitable for other spraying applications. A top quality sprayer which comes with 2 years warranty which is fantastic since most only come with 12 months warranty. All the garden sprayers above are of good quality and offer good value for money, in general you get what you pay for, and the more you pay the better a product you will get. If you are an amateur gardener looking for a quality garden sprayer to use a few times a year, then one of the cheaper sprayers would be ideal and should offer years of use if looked after correctly and cleaned after each use. If you are a professional gardener or looking for a very high quality garden sprayer to use extensively, then we highly recommend investing in a high quality branded model such as those built by Hozelock or Greenkey. Their products are above the best in the industry and you will never be disappointed with them. 1. We recommend never using the same sprayer for spraying both weedkiller and pesticides or any other liquids sprayed on plants. There have been many cases where gardeners have failed to properly clean out sprayers previously used to spray weedkiller and then spraying plants with pesticides or fungicides only to find they have killed their plants. We would recommend having a second sprayer to spray weedkiller. 2. Always ensure all nuts and pipes are tight before use. 3. Only mix the amount you require to spray that day, many weedkillers and pesticides become less effective when left in sprayers over time. 4. Always mix the recommended dose as shown on the instructions. 5. Chemicals are dangerous and care should be taken including wearing protective gloves when mixing.